The White House is following recommendations from the Department of the Interior to reduce the size of two national monuments in Utah. 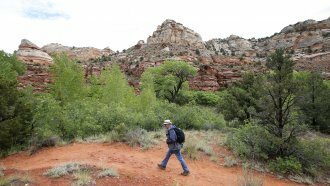 President Trump is reportedly moving forward with a plan to shrink the borders of two national monuments in Utah. Utah Sen. Orrin Hatch said Trump told him in a phone call that he would announce reductions to the Bears Ears and Grand Staircase-Escalante monuments when he visits the state in December. Former President Obama established the 1.35 million-acre Bears Ears monument last year during his last weeks in office. But Interior Secretary Ryan Zinke later recommended shrinking the monuments' borders after he completed a national monument review ordered by the White House. Trump's decision could prompt a legal challenge — while the White House can definitely establish monuments, it's not clear whether it has the power to alter or remove them.